Female zunzún (bee hummingbird) nests in May. It is the world’s smallest bird and weighs less than a dime. 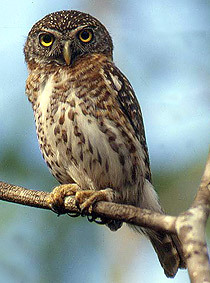 The Cuban pygmy owl is an exclusive carnivore. It’s about the size of a robin. We are delighted to share this guide to endemic and near endemic birds of Cuba. While visiting the island there is a good chance you will see some of the 41 unique birds (described below), and scores of other birds that live in Cuba and on neighboring islands, and migratory birds for which Cuba is a feeding and resting spot on their annual journeys north and south. 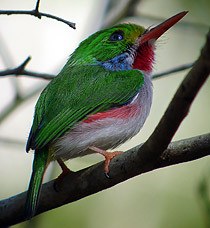 In total Cuba is home to some 370 bird species of which 30 hold vulnerable to critically endangered status. Cuba provides key wintering habitats for 284 species of migratory birds that breed on the North American continent. The island has 28 species that are endemic – native to Cuba and found nowhere else. There are 11 species considered near endemic – residing primarily in Cuba but also on nearby islands. Two species could become endemic as a result of species reclassification. This site introduces you to these 41 special birds. Endemic, and status is not threatened. 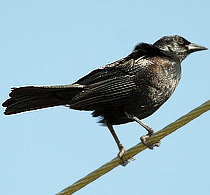 The Cuban Blackbird is a species in the Icteridae family. Its natural habitats are subtropical or tropical moist lowland forests and heavily degraded former forest. Photo Arthur Grosset. Endemic, and status is endangered. 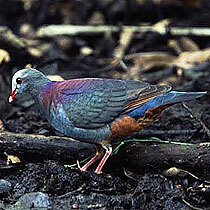 The blue headed quail dove is a species of bird in the Columbidae family. Its natural habitats are subtropical or tropical moist lowland forests, subtropical or tropical swamps, and subtropical or tropical moist montanes. It is threatened by habitat loss. Photo Pete Morris. Near endemic, and status is not threatened. 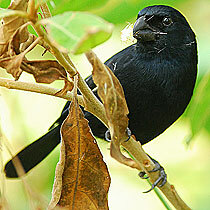 The Cuban Bullfinch is a species in the Emberizidae family. It is monotypic within the genus Melopyrrha. Its natural habitats are subtropical or tropical moist lowland forests, moist montane forests, and heavily degraded former forest. It is sometimes seen in the Cayman Islands near Cuba. Photo Ted Ardley. Endemic, and status is near threatened. 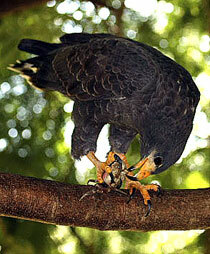 The Cuban Crab Hawk (also known as the Cuban Black Hawk) is a bird of prey in the family Accipitridae, which also includes the eagles, hawks and Old World vultures. It was formerly considered conspecific with Common Black-Hawk (Buteogallus anthracinus), but now is recognized as a distinct species by most authorities. Photo Richard Ford. Near endemic, and status is not threatened. 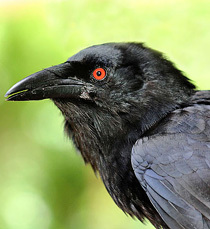 The Cuban Crow is one of four species of crow that occur on a few key islands in the Caribbean. Two of these species, the white necked Crow (Corvus leucognaphalis), and the Jamaican Crow (Corvus jamaicensis) share similar features to the Cuban Crow and are obviously very closely related to the third, the Palm Crow. 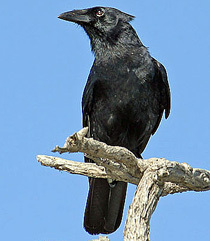 The Cuban Crow is a sociable and is found across Cuba especially in areas that have been cleared for agriculture. Its nest is built in tall trees, though little further information about breeding is recorded as yet. Photo Pedro Genaro Rodriguez. Potential endemic, awaiting species reclassification, and status is not threatened. This bird requires closer study, especially in light of the imminent splits among the Eastern Meadowlark (Sturnella magna) in North America. 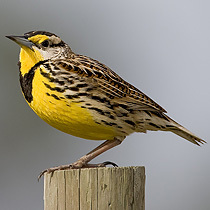 Cuba has the only population of Eastern Meadowlark in the Caribbean, and it is a resident, nonmigratory subspecies, Sturnella magna hippocrepis. Its song is unlike any Eastern Meadowlark outside Cuba. Photo Sturnelle des Prés. Near edemic, and status is not threatened. The Cuban Emerald is distributed in the Bahamas as well as in Cuba. It is found in a variety of habitats from forest to gardens. It feeds on nectar and insects. The male has a short bill with a black upper mandible and a red lower mandible with a black tip. Upperparts are dark green while underparts are shiny green with a hint of metallic blue. The undertail coverts are white and the tail is deeply forked. The female, seen here, is similar but the underparts are brownish-grey with green flanks and the tail is slightly less forked. Both sexes have a whitish spot behind the eye. 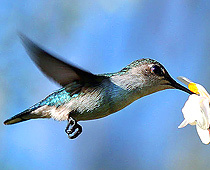 The only other hummingbird in Cuba, apart from the occasional Ruby-throated Hummingbird in transit, is the tiny Bee Hummingbird (Mellisuga helenae). Photo Doc Otto. Endemic, and status is critically endangered. 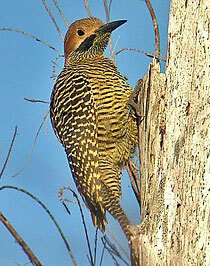 The Fernandina’s Flicker is a species of the woodpecker family. Its small population of 600 to 800 birds makes it one of the most endangered species of woodpecker in the world after the possibly-extinct Ivory-billed Woodpecker. 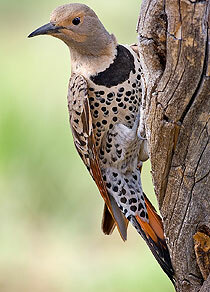 The Fernandina’s Flicker ranges in length from 14 to 15 inches. It is mostly yellowish-tan, covered with varying amounts of black barring; its underwings are yellow. The male has a black moustachial stripe, which the female lacks. Photo Pete Morris. Endemic, and status is endangered. 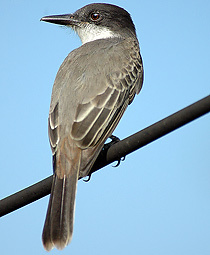 The Giant Kingbird is a species in the Tyrannidae family. It is now endemic to Cuba having disappeared from the Bahamas, Cuba, México, and Turks and Caicos Islands. It is classified as Endangered by Birdlife International. There are less than 1,000 individuals left. It is threatened by habitat loss. Its natural habitats are subtropical or tropical moist lowland forests and subtropical or tropical swamps. Photo Unknown. Endemic, and status is not threatened. 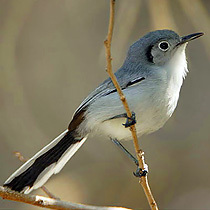 The Cuban Gnatcatcher is a species in the Polioptilidae family, the gnatcatchers. Its natural habitat is subtropical or tropical dry shrub land. Photo Eladio M. Fernandez. Endemic, and status is near threatened. The Cuban Grassquit is a species of finch. It is common across the Cuba and the Isle of Youth. Pugnacious, especially hostile while breeding, and especially so towards birds of the same species or with black and/or yellow plumage. Photo Unknown. Endemic, and status is vulnerable. The Grey-fronted Quail-dove is a species in the Columbidae family. 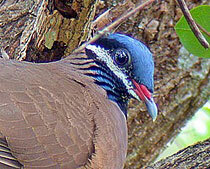 It has a close cousin in Hispaniola: White-fronted Quail-dove (Geotrygon leucometopia). Its natural habitats are subtropical or tropical moist lowland forests, swamps, subtropical or tropical moist montane forests, and plantations. It is threatened by habitat loss. Photo Carole and Peter Leigh. Near endemic, and status is not threatened. 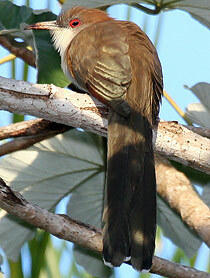 The Great Lizard Cuckoo is distributed in a variety of forested and wooded areas in Cuba and the Bahamas. It is large at half-a-meter (20 inches). It’s olive-brown upper plumage and light grey breast changes to buff and rufous on the belly. The tail is very long and patterned black and white below. The bare eye-ring is orange to red and the bill is long, decurved and blue-grey. There are three subspecies in Cuba. They feed on lizards, insects, frogs, snakes and birds eggs and nestlings. Photo Dominic Sherony. Endemic, and status is not threatened. 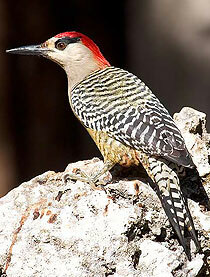 The Cuban Green Woodpecker is a species in the Picidae family. It is monotypic within the genus Xiphidiopicus. Its natural habitats are subtropical or tropical dry forests, subtropical or tropical moist lowland forests, and heavily degraded former forest. Photo Samuel Denault. Endemic, and status is critically endangered. 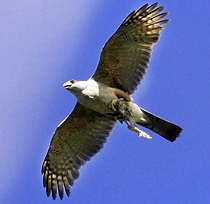 The Cuban Kite is a bird of prey in the raptor family Accipitridae. It is classified as critically endangered by BirdLife International. The current population is estimated at less than 250 mature birds and lack of recent records suggests it may even have been one of the first vertebrate species to go extinct in the 21st century. Attempts to find a remnant population are currently ongoing but have not yet located surviving birds. Photo Unknown. Few photos are available for this rare endangered bird. Near endemic, and status is not threatened. 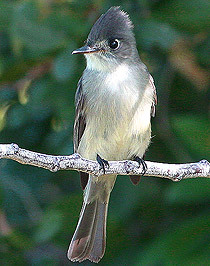 La Sagra’s Flycatcher is a passerine in the tyrant flycatcher family. It breeds in Cuba, the Bahamas and Grand Cayman in the West Indies. It is normally a year round resident, however has been known as an occasional vagrant to southern Florida. Its natural habitats are subtropical or tropical moist lowland forests, mangrove forests, subtropical or tropical moist montanes, and heavily degraded former forest. The nest is built in a tree cavity or similar natural or man-made hole, and the normal clutch is two to four eggs. La Sagra’s Flycatcher is separated from other confusingly similar Myiarchus species by its call, a high pitched single or double noted wink. Photo Eric Liner. Endemic, and status is not threatened. 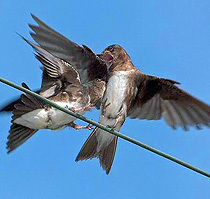 The Cuban Martin is a swallow and a subspecies of the Caribbean Martin (Progne dominicensis), and is a large swallow. Cuban Martins are gregarious communal birds that hunt for insects in flight. Their call is a gurgly chew-chew. Photo Luis O. Nieves. Endemic, and status is not threatened. The Cuban Nightjar is a species in the Caprimulgidae family (Greater Antillean Nightjar) that is found the Dominican Republic and Haiti (Hispaniola). Its natural habitats are subtropical or tropical moist lowland forests and subtropical or tropical moist montanes. This species was believed to be conspecific with Hispaniola’s Caprimulgus ekmani. 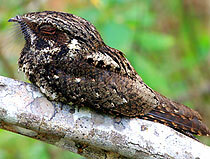 Before the split, the species was named Greater Antillean Nightjar. Photo Unknown. Potential endemic, awaiting species reclassification, and status is not threatened. The Cuba Flicker is a subspecies of the Northern Flicker (Colaptes auratus). It is the only woodpecker that commonly feeds on the ground. The Cuban Flicker (Colaptes auratus chrysocaulosus) occurs on Cuba and Grand Cayman Island. 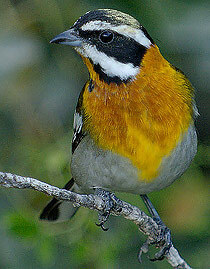 Traits that distinguish the Cuban subspecies are the presence of a bright red nuchal (nape) patch (absent in others) and the color of the throat, ear-coverts, crown, and malar stripe. The malar stripe, or “mustache,” is the only markedly dimorphic trait that distinguishes the sexes. Photo NaturePicsOnline.com. Near endemic, and status is not threatened. 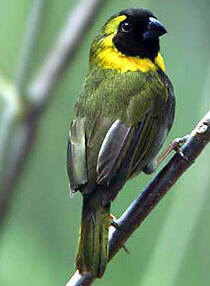 The Olive-capped Warbler is a species in the Parulidae family. It is found in Cuba, the Bahamas, and Turks and Caicos Islands. Its natural habitat is subtropical or tropical moist montanes. Photo Giff Beaton. Endemic, and status is not threatened. 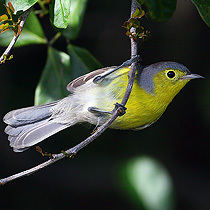 The Oriente Warbler is a species in the Parulidae family. Its natural habitats are subtropical or tropical dry forests, subtropical or tropical moist lowland forests, subtropical or tropical moist montanes, and subtropical or tropical dry shrubland. Photo Samuel Denault. Endemic, and status is critically endangered. The Cuba Palm Crow is a relatively small black bird in the crow family and a close cousin to the Hispaniolan Palm Crow (Corvus palmarum) that occurs mostly Dominican Republic and Haiti. Its habitat is mainly mountain pine forests. Photo Pedro Genaro Rodriguez. Endemic, and status is vulnerable. 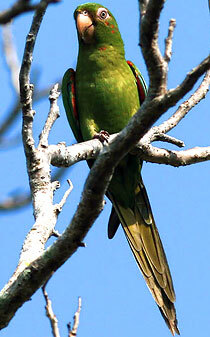 The Cuban Parakeet, Conure De Cuba, or Aratinga Cubana is a species of parrot in the Psittacidae family. It is commonly known as catey. It is now extinct on the Isle of Youth. Its natural habitats are subtropical or tropical dry forests, dry savanna, and arable land. It is threatened by habitat loss. Photo Paul Jones. Near endemic, and status is near threatened. The Cuban Parrot is a subspecies of the Rose-throated Parrot that exists in the Bahamas and Grand Cayman Islands. It is found in woodlands and dry forests of Cuba. 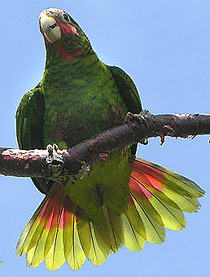 Due to ongoing habitat lost, occasional natural disasters and hunted in some areas, the Cuban Parrot is evaluated as Near Threatened on the IUCN Red List of Threatened Species. Photo Pat Barry. Near endemic, and status is not threatened. 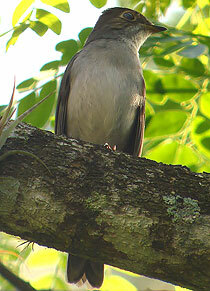 The Cuban Pewee is a species in the Tyrannidae family. It is found in Cuba and the northern Bahamas. The Greater Antillea Pewee, to which is the Cuban version is closely related, is found in the Dominican Republic, Haiti, Jamaica, Puerto Rico, and Turks and Caicos Islands. 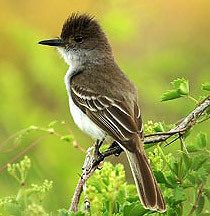 The form found in Cuba and the northern Bahamas is also known as the Crescent-eyed Pewee or (the nominate subspecies) Cuban Pewee. Its natural habitats are subtropical or tropical dry forests, moist lowland forests, subtropical or tropical montanes, and heavily degraded former forest. Photo Samuel Denault. Endemic, and status is not threatened. 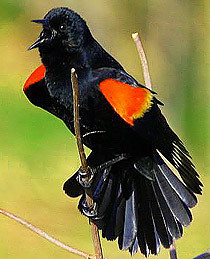 The Red-shouldered Blackbird of Cuba is a species in the Icteridae family, but distinct from continental forms in a number of important morphological and behavioral traits, have been recognized as a separate species. Photo Unknown. Endemic, and status is not threatened. The Cuban Screech-Owl or Bare-legged Owl is a species of the Strigidae family. It is the only species in genus Gymnoglaux. Its natural habitats are subtropical or tropical dry forests, subtropical or tropical moist lowland forests, and heavily degraded former forest. Photo Jim Rose. Endangered, and status is near threatened. The Cuban Solitaire, also known as the Cuban nightingale, is a species in the Turdidae family. Its natural habitat is subtropical or tropical moist montanes. It is threatened by habitat loss. Photo Colin Bushell. Near endemic, and status is not threatened. The Thick-billed Vireo is a small songbird. It breeds Cuba and the Bahamas. It occasionally can be found as a vagrant in south Florida. 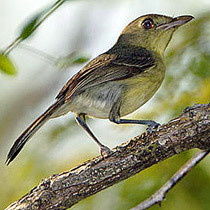 This vireo frequents bushes and shrubs in tropical thickets. The grass-lined nest is a neat cup shape, attached to a fork in a tree or bush branch, usually with two to three dark-spotted white eggs. Both the male and female incubate the eggs and are in coloring. The diet of this species consists almost exclusively of insects. Photo Joseph Burgess. Endemic, and status is not threatened. Of all todies, the Cuban Tody is the most colorful. It can only fly short distances with its rounded wings. They are often seen in pairs and mate in the spring. When nesting they dig a one inch tunnel with a chamber at the end in a clay embankment. The dwelling is covered in a thick glue-like substance mixed with grass, lichen, algae, small feathers and other materials that act as a sealant. Photo Colin Bushell. Endemic, and status is near threatened. 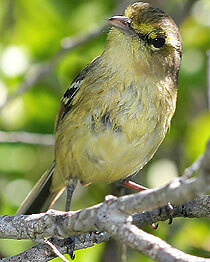 The Cuban Vireo is a species in the Vireonidae family and is reasonably common in forest and woodland. Upperparts are dark olive-grey while underparts are pale yellow. There is a large creamy white crescent behind the pale brown eye. It shows one or two faint wing-bars. Photo Unknown. Near endemic, and status is not threatened. 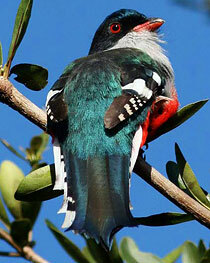 The West Indian Woodpecker is distributed in Cuba, the Bahamas and Grand Cayman. It is found in forest, palm groves and mangroves. Both sexes have red nasal tufts but the male has a red crown and nape while the female only has red on the nape. It nests in holes that it excavates in dead trees and in live or dead palms. 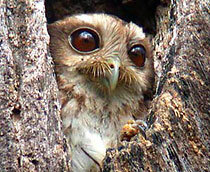 Its abandoned nest holes are often used by other species such as the Cuban Screech-Owl, the Cuban Pygmy-Owl, the Cuban Parrot, and the Cuban Parakeet. It feeds on insects, larvae, lizards and frogs as well as fruit. 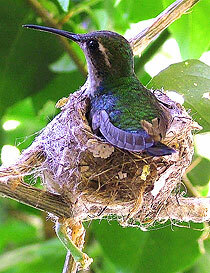 Given its role in dispersing seed and providing nest holes for other species it is fortunately quite common in Cuba. 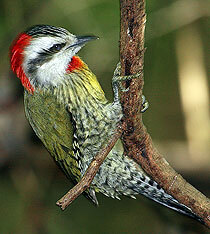 The Cuban version of the West Indian Woodpecker may someday be given endemic status. Photo Arthur Grosset. Near endemic, and status is not threatened. The Western Spindalis is a species in the thraupidae family. It is found across much of the Caribbean. Its natural habitats are subtropical or tropical moist lowland forests, moist montanes, and heavily degraded former forest. Photo Dan MacIntosh. Endemic, and status is not threatened. 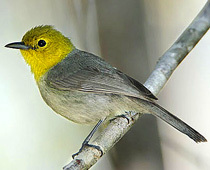 The Yellow-headed Warbler is a species in the parulidae family. It exists only in western Cuba’s subtropical and tropical dry forests and subtropical and tropical moist lowland forests. Photo Eladio M. Fernandez. Endemic, and status is endangered. The Zapata Rail is a medium-sized dark colored rail. It is the only member of monotypic genus Cyanolimnas. It exists only in the Zapata region of Cuba. Both sexes are similar with dark brown plumage, yellow and red-based bill, short wings, red eye, white undertail coverts, orange legs and greyish-blue below. 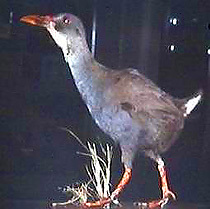 The Zapata Rail is confined and endemic to swamp and wetlands of Zapata in southern Cuba. Due to ongoing habitat loss, small population size, limited range and predation by introduced species, the Zapata Rail is evaluated as Endangered on the IUCN Red List of Threatened Species. Photo Unknown. Note Few photos exist of this elusive rare bird. Endemic, and status is endangered. 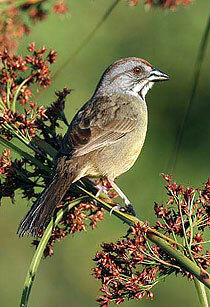 The Zapata Sparrow classified as Endangered since there are less than 1,000 individuals left. There are three sub-species found in different parts of the island only one of which, Torreornis inexpectata, is found in the Zapata Swamp. This has led to suggestions that the English name be changed to Cuban Sparrow. All three subspecies are similar but are found in very different habitats with the nominate found in the flooded saw-grass of the Zapata Swamp, Torreornis sigmani found in the thorn scrub and cacti of Guantánamo province and Torreornis varonai found in the dry forest and coastal vegetation of Cayo Coco. Their food reflects the different habitats with Zapata birds feeding on the eggs of Pomacea snails as well as lizards and seeds and Guantánamo birds also feeding off cactus fruits. Photo Paul Jones. Endemic, and status is endangered. The Zapata Wren is medium sized and grayish-brown and lives only in dense shrubs of the Zapata Swamp. It feeds on insects, spiders, small snails, lizards and berries. 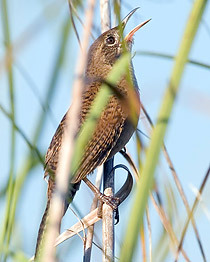 The wren typically makes its nest in sawgrass tussocks. It is thought to breed between January and July. Less than a hundred couples are thought to remain. Like most wrens, it is a skulker, which added to its preferred habitat, makes it quite difficult to see. Photo Arthur Grosset.